Pyongyang University and NK: Just Do IT! The curtain is rising on a bold experiment to engage North Korea’s academic community—and possibly shape the country’s future. On October 25, 2010, Pyongyang University of Science and Technology, or PUST, opened its doors to 160 elite North Korean students. By improving North Korea’s technical prowess, PUST might nudge the country’s tattered manufacturing-based economy toward an information-based economy. “Our purpose is the globalization of North Korea through PUST. In that way, their economy can gradually develop, which will make it easier for reunification later,” says Park Chan Mo, former president of the National Research Foundation of Korea and one of four founding committee chairs of PUST. More initiatives are in store after South-North relations improve, says Oh Hae Seok, Special Adviser on Information Technology (IT) to South Korea’s President Lee Myung Bak. “The South is ready to assist the North by building an IT infrastructure and supporting IT education, as long as the North opens its door,” he says. PUST will test North Korea’s appetite for engagement. Perhaps most discomfiting to the North is that the new university is led and bankrolled by devout Christians. The North Korean government espouses atheism and takes a dim view on South Korean evangelists, particularly for their role in an “underground railway” in northeastern China that steers defectors to safe havens. PUST leaders and professors, primarily ethnic Koreans, have promised not to proselytize. PUST’s main mission therefore is to lead North Korea out of a scientific wilderness. The North is light-years behind industrialized nations in many areas of science and technology. It excels in a few spheres. For instance, North Korea is notorious for its skill at reverse-engineering long-range missiles and fashioning crude but workable plutonium devices. Less well known, the North has developed considerable expertise in information technology—and has staked its future on it. “North Korea has chosen IT as the core tool of its economic recovery,” says Park. But it has a poor grasp on how to translate knowledge into money. “Instead of just giving them fish, we will teach them how to catch fish,” Park says. There are serious risks in giving North Korea a technical assist, according to PUST’s critics. Opinion in South Korea is split on PUST; many people have voiced concerns. The chief worry is that PUST students could feed information or lend newfound expertise to the North Korean military. To minimize these risks, PUST’s curricula have been vetted by government and academic nonproliferation experts. To proponents, the new venture’s benefits far outweigh the risks. PUST has been promised academic freedom, the likes of which has been virtually unknown in North Korea, including campus-wide internet access. “We hope that PUST will open channels to the outside,” says Nakju Lett Doh, an assistant professor of electrical engineering at Korea University in Seoul and member of PUST’s academic committee. Few people of university age or younger can imagine a world without internet. But it’s rare a North Korean of any age has tasted this forbidden fruit. The government takes infinite care to shield innocent minds from corrosive facts about the Korean War, descriptions of life in modern South Korea, and western notions of freedom of expression, among other things. Instead, the Garden of Juche offers Guang Myung, or Bright Light: an Intranet not connected to the outside world. IT Library and lecture room serving as part of the "Guang Myung" system at Kim Chaek University of Technology. When I visited Pyongyang on invitation from the DPRK Academy of Sciences in July 2004, my hosts gave me a tour of the Central Information Agency for Science and Technology’s computing center and showed me the Guang Myung home page, which reminded me of Yahoo. They claimed the system has tens of millions of records, including digital tomes on agriculture and construction as well as the complete writings of Kim Il Sung. Since then, fiber optic cables have spread Guang Myung to the far corners of the nation. “The main purpose is to disseminate scientific and technological information,” says Lee Choon Geun, chief representative of the Korea-China Science & Technology Cooperation Center in Beijing. On a visit to Pyongyang a few years ago, Lee, an expert on North Korea’s scientific community, witnessed Guang Myung in action, including a live lecture broadcast over the Intranet. At the time, he says, Kim Chaek University of Technology had around 500 Pentium 4’s and 5’s connected to the system. He estimates that nationwide, tens of thousands of computers of all types are now linked in. However, it’s not clear how effective Guang Myung is outside Pyongyang, where clunky routers funnel information to ancient machines—remember 386s and 486s? Another major woe is an unstable electricity supply that regularly fritzes electronics. Lee, who has visited North Korea 15 times, says that when he asks what scientists need most, they request laptops, whose power cord adaptors and batteries can better handle electrical fluctuations. Indeed, it’s a formidable job to erect an IT infrastructure inside a cocoon. South Korea has lent a hand. With the government’s blessing, private organizations in the South have sent approximately 60,000 IT publications—periodicals and books—to North Korean universities, and IT professors from the South have visited the North for lecturing stints, says Oh. South Korean groups have also helped train North Korean computer scientists in Dandong, China, just across the border from North Korea. The training center had to close earlier this year due to budget cuts, says Lee. The juche philosophy embraces self-reliant efforts to gather technical information from abroad. North Korean diplomats are one set of eyes and ears. They collect journal articles, textbooks and handbooks, surf the Web and ship any seemingly useful information to Pyongyang, where analysts evaluate it and censors clear it for posting. When sent via internet, information is routed primarily through Silibank in Shenyang in northeastern China. North Korea has also deployed abroad around 500 IT specialists in the European Union and dozens more to China—in Beijing, Dalian, Shanghai, and Shenyang—to acquire knowledge for the motherland. “Through them a lot of information goes to North Korea,” says Park. Such activity may seem like a packrat cramming its nest with equal portions of usable materials and shiny baubles. But it has paid off in at least one area: software development. “They are developing their own algorithms,” says Doh, an expert on control system theory. Even though North Korea’s programmers are almost completely isolated from international peers, they lag only about 5 to 6 years behind the state of the art in South Korea, Doh says. “That’s not that bad.” The Korean Computing Center and Pyongyang Information Center together have around 450 specialists, and universities and academy institutes have another 1,000 more experts on computer science, says Lee. And all told there are about 1,200 specialized programmers. But the resemblance to IT as we know it ends there. “In North Korea, IT is quite different from what most people think,” says Lee. Most computing efforts these days are focused on computerized numerical control, or CNC: the automation of machine tools to enable a small number of workers to produce standardized goods. “Their main focus is increasing domestic production capacity,” says Lee. North Korea’s CNC revolution is occurring two to three decades after South Korean industries adopted similar technologies. And North Korea is struggling to implement CNC largely because of its difficulties in generating sufficient energy needed to make steel—so its machinery production capacity is a fraction of what it used to be—and it lacks the means to produce sophisticated integrated circuit elements. That’s a challenge, because no country—China included—openly flouts UN sanctions on high-tech exports to North Korea. Any advanced computing equipment entering the country is presumably acquired through its illicit missile trade and disappears into the military complex. 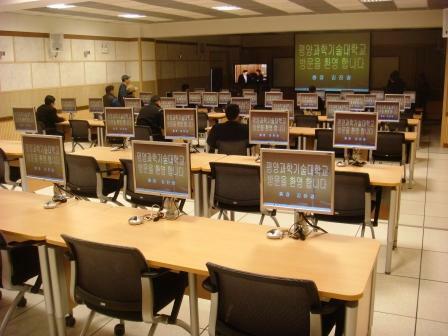 North Korea’s civilian computer scientists are left fighting for the scraps. One of only five Ph.D. scientist-defectors now known to be in South Korea, computer scientist Kim Heung Kwang, fled North Korea in 2003 not for political reasons or because he was starving—rather, he hungered to use modern computers. This improbable initiative in scientific engagement was a long time in the making. PUST’s chief architect is founding president Kim Chin Kyung, who in 1998 established his first venture in higher education: Yanbian University of Science and Technology in Yanji, the capital of the Yanbian Korean Autonomous Prefecture in northeastern China’s Jilin Province, just across the border from North Korea. A businessman who studied divinity in university, Kim, who goes by his English name James, was accused of being a spy on a visit to North Korea in 1998 and imprisoned there for six weeks. He stuck with YUST, however, and in 2001, North Korean education officials visiting the university stunned Kim by inviting him to establish a similar university in Pyongyang. Kim got a rapturous response when he pitched the idea to YUST’s sponsors. Progress came in fits and starts. PUST was originally envisioned to open in 2005, but work on the initial 17 buildings of the $35 million, 100-hectare campus in southern Pyongyang’s Rakrang district was completed only last year. North Korean education officials have promised the school academic freedom and internet access. Such startling privileges will be doled out byte by byte. “In the beginning, they are allowing us to do emailing,” says Park. Full internet access is expected to come after PUST earns their keepers’ trust. “To do research, really you have to use the internet. The North Korean government realizes that. Once they know students are not using the internet for something else, it should be allowed,” Park says. While YUST and PUST may both have ardent-Christian backers and cumbersome acronyms, the atmosphere on the two campuses will be markedly divergent. In Yanji, encounters outside the classroom are common: faculty and students even dine together in a common hall. “YUST professors and students are like one family,” says Park. In contrast, PUST students and faculty will inhabit two entirely different worlds that only merge in the classroom. The North Korean government handpicked the inaugural class of 100 undergraduates and 60 graduate students, including 40 grads who will study IT. All will study technical English this fall, then in March a wider roster of courses will become available after key professors and equipment arrive on campus. A student leader will shepherd students to and from class to ensure that no lamb goes astray. “There will be no way to teach the gospel,” says Doh. PUST professors expect to be impressed with the students, selected from Kim Il Sung University and Kim Chaek University of Technology. “These are the most brilliant students in North Korea,” says Doh. PUST plans to ramp up enrolment to 2,000 undergrads and 600 graduate students by 2012. To expose these young, agile minds to a wide range of ideas, PUST plans to fly in a number of visiting professors during the summer terms. They also intend to seek permission for students from other Pyongyang universities to attend the summer sessions. As trust develops, PUST hopes that some of its students will be able to participate in exchange programs and study abroad. PUST’s success may hinge on the disposition of North Korea’s leader in waiting. Kim Jong Un was tutored privately by a “brilliant” graduate of Université Paris X who chaired the computer science department at Kim Chaek University of Technology before disappearing from public view in the early 1980s, says Kim Heung Kwang, who studied at Kim Chaek before working as a professor at Hamhung Computer College and Hamhung Communist College. After defecting and settling in Seoul, Kim founded North Korea Intellectuals Solidarity, a group of university-educated defectors that raises awareness of conditions in North Korea. Another big wildcard is North-South relations. After the sinking of the Cheonan, South Korea froze assistance to the North. In the event of a thaw, “the South wants to build a digital complex” in the Demilitarized Zone (DMZ) or in South Korea similar to the Kaesong industrial complex, says Oh. This, he says, “would be the base camp of North Korea’s IT industry development.” North Korea has reacted lukewarm to the idea: It would prefer that such a venture be based in Pyongyang, says Lee. To facilitate denuclearization and help skilled North Korean workers adapt to market economics, the Science and Technology Policy Institute in Seoul has proposed the establishment of an Inter-Korean Science and Technology Cooperation Center modeled after similar centers established in Kiev and Moscow after the Soviet breakup.